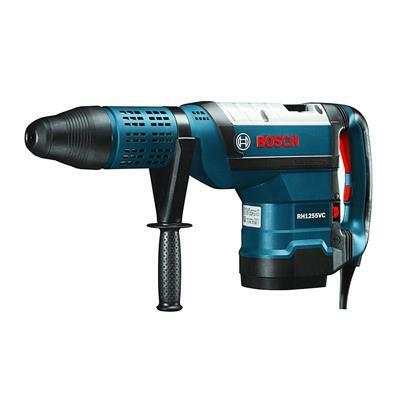 BOSCH RH1255VC 2 In. SDS-max® rotary hammer has Turbo™ Power, which gives the tool a torque and speed boost in hammer mode. It also provides 14.1 ft.-lbs. of impact energy for top-rated power. At under 27 lbs., it has outstanding performance-to-weight ratio in a 2 In. hammer. It features Vibration Control™ for additional operator control while mitigating vibration in the hammer mechanism and in the handle. This hammer provides Constant Response™ circuitry for smooth starts, precise hole placement and constant speed under load. Vario-Lock™ positioning permits rotating and locking the chisel with precision. And the SDS-max® bit system provides toolless bit changes.